But thankfully, Lifetime, Netflix, and Hallmark (and, in a blessed update, TV One, BET Her, Freeform, and Bounce TV) have heard our cries and have finally provided some Christmas movies starring people of color. We celebrate Christmas and like seeing people fall in love too! There are a handful of titles on this list that look fun and cute and a great way to spend an afternoon, and hopefully more networks get on the bandwagon and every year we get more and more. (Also maybe some celebrating other holidays. Maybe I’ll write a Kwanzaa-themed romcom someday.) Until then, here’s what’s playing and where they’re airing. Leave a comment if I missed one! I’ve heard good things about this story about a photographer who runs into a psychic advent calendar. Somehow that leads her to love, I’m ready to find out how. I’m brimming with excitement that she’s a photographer, like I sometimes am. I’ll likely start next week when Thanksgiving finally kicks off. No matter how hard I try, I can’t start Christmas earlier than that. But I’m glad this movie is already there waiting for me. 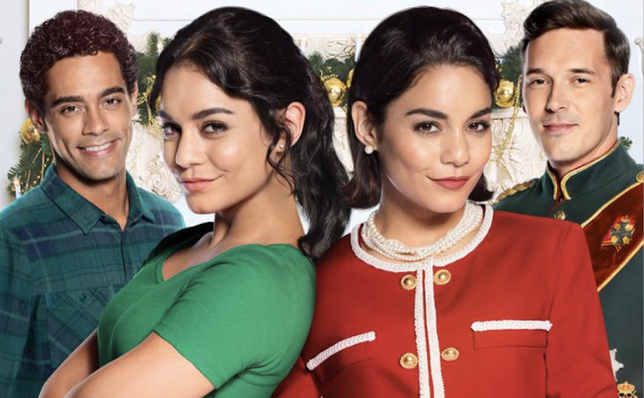 Vanessa Hudgens stars in a Meghan Markle meets Prince(ss) and the Pauper story about look-a-likes — a Duchess and a commoner from the Chi — who trade places and fall in love while dressing up. Tatyana Ali is in not just one, but TWO Christmas romcoms this year! 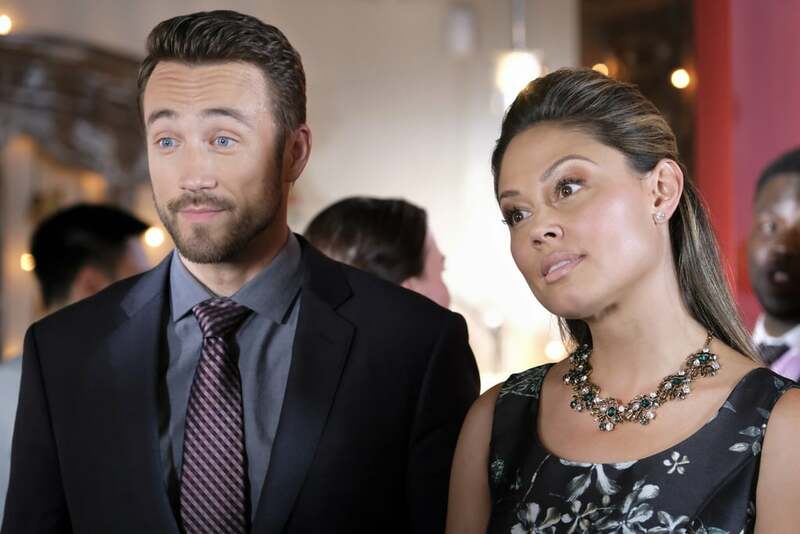 In Hallmark’s Christmas Everlasting, Tatyana’s character is a New York lawyer on track to become partner at her lawfirm. But her sister dies, leaving her to return to Wisconsin (Wisconsin?!) to help with the funeral, re-encountering her past. She reconnects with my fave romantic lead from Queen Sugar, Dondre Whitfield (I’ve been asking for him to have a romcom for ages, so I’ve been doubly blessed that it’s a Christmas one) her old high school sweetheart and a fellow lawyer. Not-Remy tells her she’s gotta live in her family home for 30 days before she can settle her sister’s estate, leading her to forming human connections and all that jazz (who doesnt love a good New York High Powered Lawyer Softens Up trope?). Remember Dr. Stephanie from Grey’s Anatomy? She left the show to do other things and here’s one of those other things! This one’s another “girl goes back home” story but this time she’s an architect (okay Black architects!!) who has to change a historic local playhouse into a multiplex. Jerrika’s character has to convince the theater owner to save the playhouse, while also keeping her job and maybe falling in love in the process. So. Many. Tropes! Christina Milian’s character, Noelle, in this one sounds like a bit of a Scrooge who must tend to her Christmas-loving late mother’s house. She finds out that her mom hired Dave to decorate the house even though she died, and Grandpa Gene, I mean Dave (and the spirit of Christmas in the air!!!) must convince Noelle to embrace Christmas and further her mother’s legacy in the town. (I tried to get an AM to PM reference in there, but I failed.) Never forget Mark Taylor was in Seventeen Again! My 2000s hearts is singing! 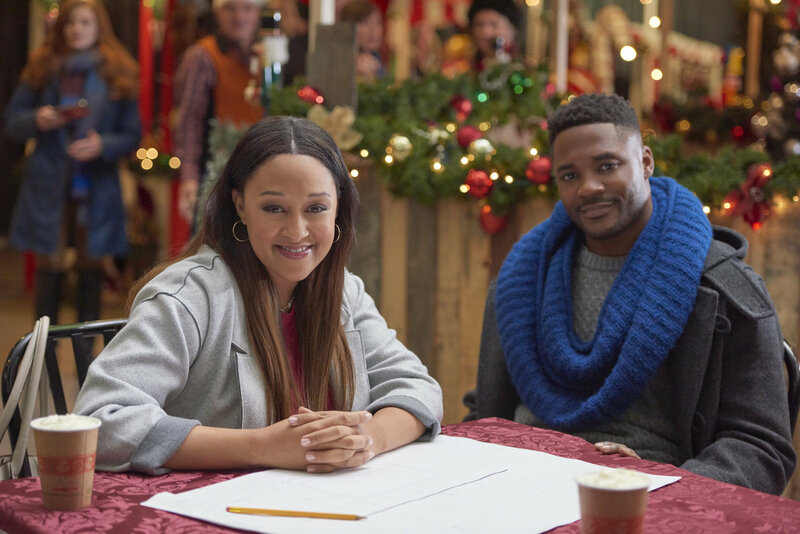 Tia Mowry-Hardict also stars in two Christmas movies this year. She also plays an architect (okay Hallmark!) who wins a contest to build life-sized gingerbread houses (what?! ), which could lead to a promotion. Tia convinces a single, hot dad bakery owner to work with her on the project and falls for him AND HIS KID in the process. Omggg. Also it’s set in Philly! The Spy Kids kids are all grown up and starring in Christmas movies! But here’s the thing: the male lead? ALSO AN ARCHITECT (but a white guy this time). (Who do we blame for this Hallmark? All those fixer upper shows?). Architect Steven hires a holiday coordinator (Gretchen, PenaVega) to make his house Christmassy but in Hallmark’s own words: “neither expected it to bring them closer to each other.” (Read it aloud in breathy italics. Then laugh.) But will Gretchen stay in the Christmas love she and Steven have formed or will she take another opportunity? Sounds angsty! In Tia Mowry’s second romcom of the season, Jen is on the verge of a huge promotion in San Francisco when she inherits an inn in Alaska. She heads north to see what’s up and meets Steve and a lovely Christmas-loving community. Could Alaska beat San Francisco for her heart? This movie also stars Tia’s Sister, Sister co-stars Jackée Harry and Tim Reid. It’s a mini reunion! In Tatyana Ali’s second holiday romcom of the season, Ashley Banks gets to hang out with Rudy and Vanessa Huxtable, aka Keisha Knight Pulliam and Tempest Bledsoe co-star! Isabelle (Ali) returns home (somebody always returning home in these things) to see that her high school sweetheart, who she left out in the cold to go study music in New York, is directing the Christmas Eve Paegent. Can they work together and rekindle that flame? Will they sing beautiful songs? Will we cry when they kiss after their sing together at the paegent?! Find out on Jingle Ball Z! This one airs one day after Ali’s other one on Hallmark, so make a marathon out of it with your DVR. Nick Lachey’s wife, Vanessa, who I just learned is Filipina, stars as a working mom who meets a working dad when they mix up their toys at the department store. Okkaaaaay, yes, a let’s track down these toys and track down the love in our hearts story. Let’s. Go. Grown Penny Proud, ahem, Kyla Pratt, aka Sadie in this movie, and her childhood best friend Ben made a Christmas pact behind their church (aww) I presume to be friends forever and to keep up their annual traditions no matter what. They planted a tree (aaawww) and, according to Lifetime: “With each Christmas that passes by, Ben and Sadie’s Christmas tree grows taller and stronger; and so does their love.” SO DOES THEIR LOVE, YOU GUYS!! I bet they decorate it together at the end and kiss and then they flash forward to their kids playing under the tree or something. Also DWAYNE AND WHITLEY STAR?! IMDb has no details on who they play yet, but… is it December 2 yet? I read the title of this in Toni’s signature tenor. I hope there’s a Toni Christmas song to go with this movie, which is apparently a Christmas Carol!! Alexis is a money manager who doesn’t like the spirit of Christmas, so some spirits of Christmas come visit her, “forcing her to risk the one thing money can’t buy: her heart.” Let’s just hope her Yuletide Beau is man enough for her. If you watch The Good Place (which you totes should be doing) you know Tiya Sircar as Real Eleanor/Vicki (spoilers on whether that’s one character or two, real ones know what’s up). Well she stars as a NYC event planner who spends time with “Grandma Frances” in Chicago for the holidays. There’s a holiday ornament scavenger hunt, a love story, and wise lessons. (But I hope they explain why Indian actress Sircar has a white Grandma. It happens, but I hope they get into it. UPDATE! I was tipped off to some recent additions by TV One and BET Her, so I’m adding them to the list! If I’ve missed any others or new ones get announced, please let me know! Kenni (Tamela Mann) guess the trope: returns home! This time, to Columbia, South Carolina. She reconnects with high school friend Jessie (David Mann) and he introduces her to people from the local wellness facility. When the Jessie is threatened with losing the facility, Kenni tries to help save it, but they may need the miracle of Christmas in order to make it happen. You know there’s gonna be some church and some sangin’ if the Manns are involved, so buckle in! I’ve loved Essence Atkins since Smart Guy! She stars as Madison, a single mom who wants her teen kids to have a great Christmas, but she’s fired and her bank account is frozen (been there), so she gets a gig working for a (also secretly broke) football player, who she clashes with. Yessss opposites attract!! She’s bookish and he’s sporty, will they make it out of the poorhouse together?! This one is another Christmas Carol take, this time with Mia Stone, a businesswoman and grinch of a boss who only cares about money. But the love of her life makes her consider her decisions, as well as some ghosts from her past present and future. 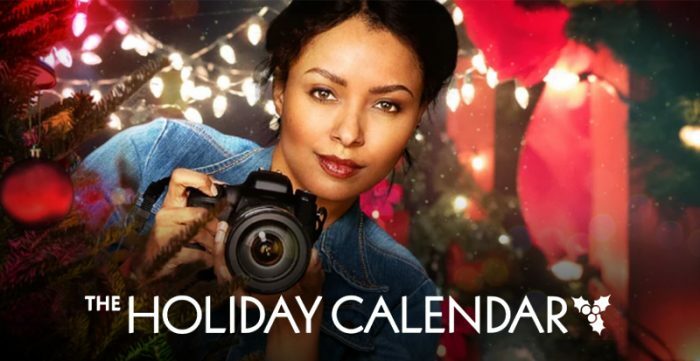 Sabrina (Tammy Townsend) must face her ex-husband at Christmas dinner when their daughter Leslie (Terri Abney) brings home her new fiance Juan. A dinner time movie with some family mess! Anyone looking to avoid theirs can look no further than this hopefully juicy story. Part of Freeform’s Kick Off to Christmas (their lead-in to 25 Days of Christmas), this one sounds like the romcom version of Scandal, honestly. Jillian, a political consultant, is about to work spin for her mayoral candidate boyfriend when she’s given some sort of truth serum before meeting his family. Who doesn’t love a “can only tell the truth” trope?! From TV Guide: “The Christmas rom-com stars the married couple as two insomniacs who discover they can only get a good night’s sleep when they are sleeping next together. Odette stars as Lizzie, a high-end event planner who’s facing down her biggest event yet: her own New Year’s Eve dream wedding to her fiancé Josh (Charles Michael Davis).” This is SUCH a fanfic trope!! And don’t forget while you’re cooking your holiday eats, loading the dishwasher, or resetting your DVR, that you can play John Legend’s new Christmas album, A Legendary Christmas. Alexa PenaVega and Carlos PenaVega played together in one of the summer hallmark movies, Love at sea! It’s really cute and they are fabulous on screen together.